Animal Lifeline - Times Publishing Newspapers, Inc. The Animal Lifeline’s mission is to develop humane solutions for at risk pets in communities through education, disaster mitigation, adoption and rescue support, transport assistance, food and supply assistance, and financial and in-kind support. Thrift Shop – The Animal Lifeline Thrift Shop is located in a small corner of the Warrington Pavilion Shopping Plaza at 111 Easton Road, Suite #24 in Warrington. The shop’s sole purpose is to provide funding, food and transport to at risk, homeless animals and feral colonies within our community and across Pennsylvania. Each time you shop at this store, you are helping an animal find its forever family and/or providing food for pets whose families are experiencing a downturn in their economic situation. This shop carries a great inventory of hundreds of household goods, as well as clothing and shoes for adults and babies. Ride to Rescue – This program gives hope to animals in need by providing lifesaving free transport for animals from overcrowded, high kill shelters to loving adoptive homes. Their team of compassionate volunteers also provides transport to animals affected and displaced by disasters and provides assistance to law enforcement in removing animals from situations of neglect and abuse. SNAP – Animal Lifeline Spay/Neuter program works in collaboration with area veterinarians, shelters, rescues and clinics to provide low cost spay and neuter resources for low-income clients and feral cats. PET FOOD PANTRY – Animal Lifeline provides hundreds of pounds of dog and cat food to families who are currently financially unable to provide food for their pets. Cat and dog food is available for families who qualify. 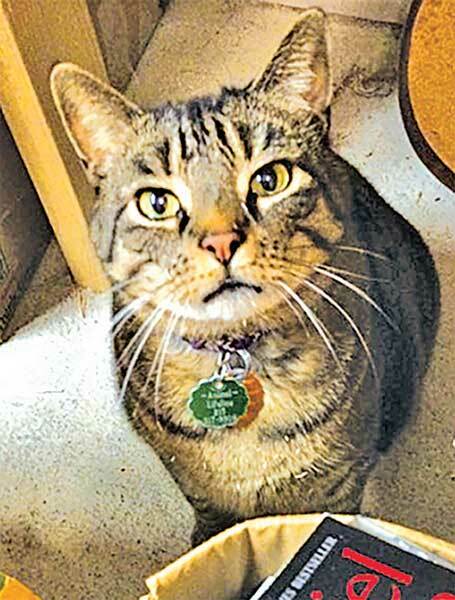 Animal Lifeline also provides cat food to caregivers of “feral” colonies. Animal Lifeline is always in desperate need of donations of dry cat food. Thrift Shop hours are Tuesdays from noon through 7:00pm, and Wednesdays through Saturdays from 10:00am to 4:30pm. Donations are accepted during store hours up until one hour before closing. Please shop, donate and volunteer; joining the dedicated staff of caring volunteers at the Thrift Shop. Community Service volunteers with hours to complete are always welcome to volunteer. For more information about how you can volunteer at the Thrift Shop, make a donation to Animal Lifeline or help save an animal’s life, call 215-343-5050. Also visit the Animal Lifeline at www.animallifelinepa.org or on Facebook. PHOTO CAP: Animal Lifeline’s store cat Willie, sorting donations in the Intake Room.